For years, I have had a large black and white sarong that remained in my dresser drawer. I am not a sarong type of gal. But while packing up my home of many years and giving away my stuff, I recognized the value of this large, thin, fabric garment. This light-weight garment plays several roles. In cold New York and Boston at the start of my trip, my sarong was my bathrobe, keeping me warm after a shower. This continues through much of my travels. In hot Mexico, it helped me dry off after a shower because in humidity my travel towel only does so much. At night in Mexico and later elsewhere in Central America, when the fan blows to cool down the room and keep Mosquitos away, my sarong becomes a blanket keeping the breeze from being cold and keeping me awake. In Panama, my sarong learned that it’s a beach blanket. For other women, a sarong has become a dress. Living on a sailing yacht in Honduras my sarong has become my bed sheet too. Staying at friend’s places, I have done this while borrowing their beds. It doesn’t cover an entire bed but it covered the area where I slept. For a friend who traveled in the Sahara and lived in the desert, a sarong became a headwrap. A sarong will also save you over and over as a cover-up — whether as a skirt/leg-covering or shoulder/arm covering — when you unexpectedly happen upon a church, temple, group of monks/priests/rabbis, government building or any religious or official building. it turns out I definitely am a sarong type of gal. And I have a feeling you will be too as you travel just about anywhere for any amount of time. Men: this will work for you as well. Became a shawl keeping me extra warm inside during a cold in the mountains of Israel. Became an extra large scarf to keep my neck warm when I went outside in that mountain winter. 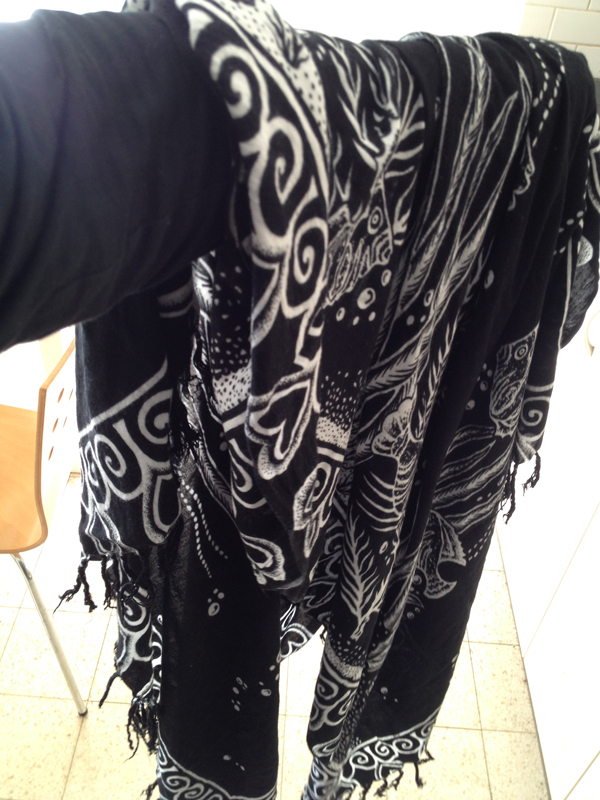 When I came up from hot Eilat to cold Jerusalem without winter clothing, my sarong was my coat as well. Funny thing: Feb 24, 2017, I watched Shark Tank and saw a supposedly new kind of beach blanket that they claimed could double as a sarong — and was priced at $47! Yet we travelers have long known that sarongs already double as a blanket (and so much more) and doesn’t cost close to that much.